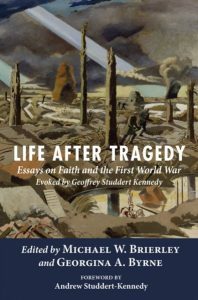 Review of Michael W. Brierley and Georgina A. Byrne, Life after Tragedy: Essays on Faith and the First World War evoked by Geoffrey Studdert Kennedy (Eugene, OR: Cascade Books, 2017). Pp. xxiv + 254. ISBN 978-1-5326-0226-9. The many centenary anniversaries of the First World War which have accumulated in Britain since 2014 have produced many significant contributions in many different forms. They have also given historians of religion an audience for their growing explorations of the diverse religious dimensions of the conflict. One of these dimensions has been the experiences of chaplains to the armed forces—a field which that fine historian, Michael Snape, has made his own. It is in this context that the striking figure of Geoffrey Studdert Kennedy emerges. Studdert Kennedy, or ‘Woodbine Willie’, as he was affectionately known by soldiers, has long been the most well-known of the British wartime chaplains. He has attracted the attention of scholars of various kinds for his poetry (The Unutterable Beauty, published in 1927, remains much admired in some quarters), his trenchant criticisms of the status quo, his uncompromising socialism, his pungent scepticism of authority (one of his books was simply called Lies), and his determination that the ghastliness of war must surely and eventually yield a better world. But he was also the embodiment of courage and unselfconscious sacrifice (he won the Military Cross) and his early death, exhausted, at the age of 45, presented something of the quality of a martyrdom—not so much to the powers of the age but perhaps to the whole age in which he lived. Westminster Abbey notoriously turned down the idea of hosting his funeral. One suspects that Studdert Kennedy would have been delighted by the compliment. This collection of anniversary essays is very much the work of two members of the clergy of the Church of England who have sought to claim for their cathedral something of a responsibility for public scholarship and critical reflection. This is admirable, and these days rare. Once I would have thought that an English cathedral could make a very good home to scholarship and that English priests at large might know how to value the reality of historical experience. I have long since lost that faith and find that even a book like this cannot quite revive it. Nonetheless, what we have here is solid fare and it expresses the commitments of ten priests, while the two laymen turn out to be lay canons of cathedrals. The effect is collegial: for the most part they share a common geography as well as denomination and one senses that they are happy to be found in company together. Michael Snape inaugurates the volume with an efficient ‘reconsideration’ of British religion and the First World War, while Michael Brierley offers a brisk sketch of the life of Studdert Kennedy. John Inge presents a more personal and wide-ranging reflection on the war as it affected the sensibilities of ‘place’ and ‘home’, finding Studdert Kennedy at home only in the Christ of the Gospels and the worship of the Church. Peter Atkinson confronts Studdert Kennedy the poet and holds to account the imperious responses of later English literary critics, particularly I.A. Richards and Roy Fuller, before proceeding to a discussion of the poetry of Geoffrey Dearmer. Michael Brierley returns with a discussion of Studdert Kennedy and the ‘new vision’ of a suffering God—a vision which would resonate so profoundly, and be developed, in the later theology of the European twentieth century. Georgina Byrne examines different forms of preaching (‘Prophesy or Propaganda?’), locating Studdert Kennedy alongside the ‘intensely patriotic’ Bishop of London, Winnington Ingram (who has almost become a subject, or at least a controversy, in his own right) and the eloquent individualist and pacifist (of a kind), Maude Royden. A discursive Mark Dorsett places Studdert Kennedy in the company of the like-minded Edward Lee Hicks (a notable bishop of Lincoln and a leading Christian Socialist) and the influential thinker R.H. Tawney, while looking to further horizons. David Bryer provides a useful survey of the war and its impact on the development of humanitarianism while Alvyn Pettersen discusses images of glory in war memorials, examining those at Worcester itself and at Magdeburg Cathedral (by Ernst Barlach) before jumping, attractively but perhaps surprisingly, into a reflection on the life of the fourth-century monk, Antony of Egypt. By way of conclusion Mark Chapman is very much at home in a discussion of Anglican theology, not least in its stray connections with German theologians, during and immediately after the war. Finally, the two editors retrieve and reconfigure strands in a concluding reflection on ’integration, balance and fullness’. An Afterword by the bishop of the Evangelical Church in Central Germany, Ilse Junkermann, is only momentarily a response to the life of Geoffrey Studdert Kennedy and suggests a diocesan link at work. In no small measure is the integrity of the volume affirmed by a very good, robust bibliography. In sum, there is enough here to satisfy the questions and perspectives of the conventionally-minded historian. Equally, theologians of society, war, literature ethics and aesthetics, will find much to intrigue them. Michael Brierley and Georgina Byrne have done particularly well to bring the whole feast before us and more than the figure of the marvellous Geoffrey Studdert Kennedy is honoured by it all.